Linux (Ubuntu 09.10 x86/x64 have been tested). For now, all Linux users will need to build from source. Please post any issues, comments, or questions in this thread. All known issues can be found on the wxLauncher bug tracker, but a brief list is below. Please keep in mind that this is not feature complete and there are outstanding glitches (which is why we want feedback). There was an issue with the Wings of Dawn mod image's alpha channel that causes it not to appear. [Windows] wxLauncher does not set the correct screen resolutions. This is fixed by 0.10.1, please upgrade. [OS X] On Lion, wxL's list of resolutions may include reasonable-sounding resolutions that do not appear in System Preferences >> Displays (such as 640x480), as well as unusual/odd resolutions, such as 840x524. 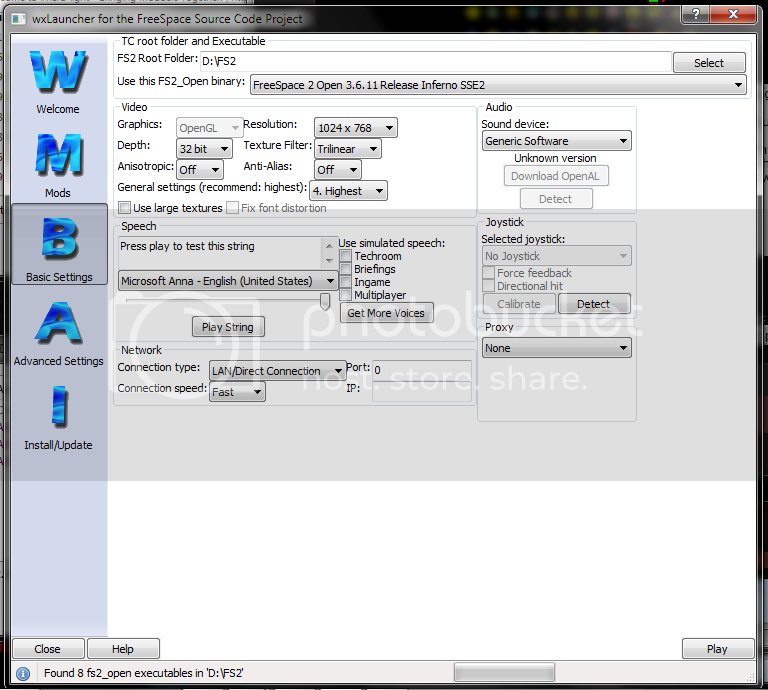 Windows users can download the installer from the downloads page of the wxLauncher website. A debug installer can be found here if you are having trouble. Windows users can also download the source code from the downloads page. Debian Linux users can find us as freespace2-launcher-wxlauncher on Wheezy and Jesse. Please be aware of the version that is packaged is may be different than the currently released version. Arch Linux users can find us as wxLauncher in the AUR. Please be aware of the version that is packaged is may be different than the currently released version. Linux users can download a the source from the downloads page. At this time, most Linux users must build wxLauncher from source. The ReadMe has the build instructions. The ReadMe is also included in the source archive and will be for the version that you download. OS X users can download a .dmg disk image from the releases page of the wxLauncher website. There is a debug disk image also on the releases page if you are having trouble. OS X users may also wish to build wxLauncher from source; the ReadMe has the build instructions. A source tarball is available from the releases page. See the read me for build instructions and requirements. Detailed list is available here. Windows - no more registry helper. Less things to go wrong! Windows - Support for SDL on Windows antipodes builds. All - Auto saving that actually works! Again! Toggle FRED launching with F3! Details are in the 0.9.4 post. Support for the new sound code! Details are in the 0.9.1 post. Details are in the 0.9.0 post. The official commit log can be viewed here. For Windows and OS X users, if you run into problems getting wxLauncher to run, download and install the launcher built in debug mode ("Downloads", above). Post or PM the log (which is located in %AppData%\wxLauncher\wxlauncher.log (Windows), ~/.wxlauncher/wxlauncher.log (Linux), or ~/Library/Application Support/wxlauncher (OS X; note the space in Application Support)). Profiles don't seem to either be saving or loading properly as loading in a previously saved profile results in no change for me. I made a whole bunch of objections on IRC which I'll type up later but overall this is looking pretty good so far. Linux user can download the source from the downloads location on our website. It has been tested on Ubuntu 9.10 and Slackware ???. We are aware of profiles not working properly. Should have been posted in the known issues list. As a workaround, stick with one profile only for testing other stuff. There are several things going wrong here. Why is the feature list using a different (extremely ugly) font, and not the system default one? Why is the preset selector not rendered correctly? Why doesn't the current commandline text field show the entire current commandline, including the -mod arguments? While we're on the subject of links, please provide one to the Troubleshooting FAQ. The image retrieval code does not seem to be able to handle a nested mod folder structure. In this case, both "Blue Planet" and "Blue Planet 2" should show images, they don't. Found 26 roots and 10803 files. Unable to find extension "GL_ATI_shader_texture_lod". BMPMAN: Found EFF (exp20.eff) with 64 frames at 30 fps. BMPMAN: Found EFF (ExpMissileHit1.eff) with 44 frames at 30 fps. BMPMAN: Found EFF (exp05.eff) with 47 frames at 20 fps. BMPMAN: Found EFF (exp06.eff) with 48 frames at 20 fps. BMPMAN: Found EFF (exp04.eff) with 37 frames at 20 fps. That means that there is still work to do until the launcher reaches the "features implementation complete" stage - and the start of beta. The WMBAI images are, of course, placeholders. We have an artist working on some icons, but we have no ETA from him ATM. As for the nested folder structure, we haven't planned for this. That's probably why the launcher mangles up the -mod flag. So here comes the stupid question: is the current launcher able to handle nested folder mods? While I expect a "Yes" answer, I thought it won't hurt to ask anyway. Yep, the Launcher handles those structures just fine. Except in cases where the commandline gets too long, of course. And I noticed tha Alpha in the title, but ignored it . Installer screws up royally if I try to put it in C:\Games\wxLauncher... the launcher can't find the splash screen, then keels over dead. Works fine if I install it to the default place, though. Organization. Separate the code files for each of the distinctive tabs/etc into sub-folders with a defined folder for anything global and another for any includes. Just having it all sitting in the root of /code/ can make it interesting to situate which file does what, often despite the fact that they have fairly clarifying names to them. This way, expansion on existing features can take place with additional files with sub-folders or the primary Global folder. It will also make for situating various "project" environment files easier. A way to group and filter the list of mods would be nice too. Like a textbox, for example, where I can type in "BL" and then the list would only show mods that contain "BL" (with different priorities: name starting > name contains > description starting > description contains). Another idea would be a Multiplayer page which would let people see who's waiting for a game and/or is logged in. At the very least a 2.0 (if not 3.0 lol) idea but might as well dream big. How exactly is skinning supposed to work? Create a resources directory in the game's folder? The font is because it was reverted so that it is working, but it will have a much better presentation when finished. The URL of the Troubleshooting FAQ is? I was only aware of gamewarden as being the only other active FS2 site, though at that this launcher is specific to the SCP's FS2Open. I was not aware that FSO even supported paths in the -mod line. I have not been able to reproduce this using the installer from the downloads page. Can you please list your procedure how you got to this error? Reorgainzing the code layout has been considered, but at this time I do not see the benefit especially with the names of the files. Does multi-player even have support for this type of thing? Nevertheless, it is defiantly something for the future. The mod.ini and the tc's mod.ini ( a mod.ini in the root of the TC folder) are supposed to configure the launcher's skin (mostly just the icons, fonts and colours), but this support is not implemented so, currently the only way to reskin is to change the resources in the launchers resource folder and/or making changes to the defaults in SkinSystem.cpp. As for other site, well, there's sectorgame and freespace.pl, for example. Surprised me as well. However, for projects in development, like the mediavps or Blue Planet, this ability is essential. On that note, a conversion to the different path signifier formats (/ on *nix, \ on Win) is necessary. It seems I was aware of the FAQ, but for some reason did not register the name. I will have to check out the other sites. Also I have posted a new revision of the launcher fixing a couple of the glaring bugs/ommisions. Links in original post have been updated, but I have not posted update source. the commandline box on the advanced settings page now displays everything. Seems the problem is that the Startup Folder is set to "C:\Program Files (x86)\wxLauncher" instead of "C:\Program Files (x86)\wxLauncher\bin"
Incidentally, I've noticed that FSO looked different with this launcher and it was because the previous launcher had put "-ambient_factor 35 -ogl_spec 20 -spec_exp 15 -spec_point 1.2 -spec_static 1.5 -spec_tube 1.5" automatically into the extra command line arguments. Is this an actual recommended default? Is there an recommended default? Yeah, one of the 0.7.1 fixes was the ability to launch the launcher directly. And we forgot to modify the shortcuts paths accordingly. Add the custom flags you mentioned by hand in the custom flags list. Se how this works for you. They work fine, but since (I've found out from Zacam on IRC) these are "recommended" by the Wiki based on commentary by the folks who best set the engine defaults, I'm thinking they could be included somehow in the new launcher.